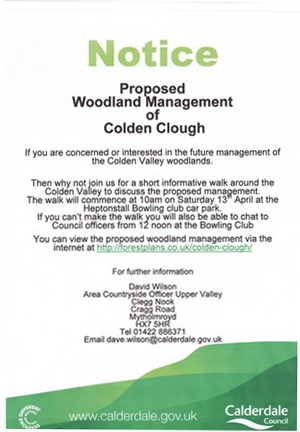 Calderdale MBC have developed proposals for the management of woodland in Colden Clough and details can be seen on the CMBC webpages at http://forestplans.co.uk/colden-clough/. There will be a short, informative walk around the Colden Valley at 10:00am on Saturday 13 April 2013, starting from the Bowling Club. Council officers will be available afterwards from 12 noon to discuss the plans, again at the Bowling Club.